Pedro Delgado Robledo (pronounced [ˈpeðɾo delˈɣaðo ɾoˈbleðo]; born April 15, 1960), also known as Perico ([peˈɾiko]), is a Spanish former professional road bicycle racer. He won the 1988 Tour de France, as well as the Vuelta a España in 1985 and 1989. Delgado inspired the name of the Scottish indie-rock band The Delgados. Delgado took part in the Tour de France eleven times. During his first participation, when he was 23, he rose to second place in the overall classification after the 17th stage, before falling back later in the event. From then on, Delgado was determined to achieve victory in this competition. In 1983, the Reynolds team participated in the Tour for the first time. Delgado was a young rider, and Ángel Arroyo was the star of the team. That year the Tour had four individual time trials (ITT), plus the prologue, and six mountainous stages, so Delgado had enough opportunities to show his talent. After the 17th stage Delgado was second in the overall classification, 1´08" behind Laurent Fignon, another 23-year-old rider competing in the Tour for the first time. Unfortunately, Delgado drank a spoilt milk shake that caused him a stomach cramp during the next stage, ending in Morzine. He lost 25 minutes 34 seconds that day, and his first chance of winning the Tour. Delgado ended that Tour in 15th position, 25 minutes 44 seconds behind Fignon. Delgado won the 1988 Tour de France by a comfortable margin. However, it was suggested that the Tour was never easy for him. The evening after the 17th stage, the television channel "Antenne2" spread the news that Delgado had tested positive in a doping test. His team director José Miguel Echevarri was informed hours after by the Tour organization without mention of the substance. That night, Xavier Louy, director of the race, went to the hotel where Echavarri was and suggested to him that Delgado should withdraw. This was similar to the "Merckx affaire" in the 1969 Giro. However, the Director of the Tour de France, Jean-Pierre Courcol, said "I now know that the letter can replace the spirit of the law and that the regulations can be played with, in order to give the appearance of utter innocence. Today, I am ashamed" and his deputy, Jean-Marie Leblanc, described it as a "dismal verdict". Other riders were also unhappy, with Andy Hampsten stating "Delgado took a drug to mask steroids. It's not on the banned list but it's a masking drug and that's what the commissaries should have acknowledged. I think it's a crime to let him wear the yellow jersey, a crime against the public and against the sport." Delgado wore the yellow jersey for eleven days, and passed doping tests every day. There was no trace of probenecid nor steroids in any other test. He thanked the public for their support and claimed he would always be grateful for the support he received during the competition. Delgado did not win the 1989 Tour de France, but it marked, perhaps, his most spectacular performance in the race. Showing up 2m 40s late for the prologue, Delgado covered the distance only 14 seconds slower than Erik Breukink, the stage winner. He became the only defending champion to begin the race in last place, 2:54 behind Breukink. As Delgado admitted later, that night he was very nervous and did not sleep. The following day there were two stages. Due to this he was very weak and suffered hypoglycemia in the second stage, a decisive team time-trial. That day he would have been dropped by his team had they not waited, and Delgado lost more time than in the previous stage, 4:32. 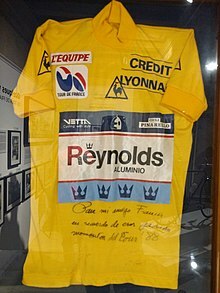 After that second stage, Delgado was last in the overall classification, more than seven minutes behind the best-classified of the favourites, Laurent Fignon. Delgado rode the rest of the race on the offensive. His reaction started in the 5th stage, a 73 km individual time-trial. He was second in the stage, 24 seconds behind an impressive Greg LeMond. In the first mountain stage, Delgado attacked during the last climb, gaining 29", but in the next stage Delgado, together with Robert Millar, finished 3:26 ahead of Fignon and 3:38 ahead of Lemond. Delgado was now 4th overall, 2:53 behind the leader, Fignon. After the 17th stage, finishing in Alpe d´Huez, final victory still seemed to be possible, Delgado was third overall, 1:55 behind Fignon and 1:29 behind Lemond. But Delgado, exhausted, was unable to make up all the time he had lost in the early stages, and the great final fight of that Tour had only two major figures: Laurent Fignon and the final winner, Greg Lemond. ^ Buckley, Peter (2003). "The Delgados". In Buckley, Peter (ed.). The Rough Guide to Rock (3rd ed.). London: Rough Guides. p. 284. ISBN 9781843531050. ^ "1983 Tour. Official results of the 17th stage". Memoire-du-cyclisme.net. 2008-10-23. Archived from the original on 2012-03-22. Retrieved 2012-07-12. ^ a b "Delgado and Arroyo talks about the Tour of France (in Spanish)". Elpais.com. 2008-07-21. Retrieved 2012-07-12. ^ "1983 Tour. Official results of the 18th stage". Memoire-du-cyclisme.net. 2008-10-23. Retrieved 2012-07-12. ^ Paul Doyle (2007-07-05). "Roche remembers his "annus mirabilis"". London: Guardian. Retrieved 2012-07-12. ^ "Giro 1969: The "Merckx affaire"". Cyclingrevealed.com. 1969-06-08. Retrieved 2012-07-12. ^ "Blazing Saddles, The Cruel & Unusual History of the Tour de France, p.225". Matt Rendell. 2007. ISBN 1-84724-155-7. ^ "Le Maillot Jaune Blanchi". Podium Cafe. 23 February 2011. Retrieved 2013-08-21. ^ "The 1988 Tour (in French)". Memoire-du-cyclisme.net. Retrieved 2012-07-12. ^ ""La petit histoire". Louy replaced (in French)". Memoire-du-cyclisme.net. Retrieved 2012-07-12. ^ Abt, Samuel (1989-07-02). "NYT report of missed start: Delgado puts tour in turmoil". New York Times. Retrieved 2013-07-04. ^ "1989 Tour. Official results of the prologue stage". Memoire-du-cyclisme.net. 2008-10-23. Retrieved 2012-07-12. ^ "The 1989 Tour in "Velo101" (in French)". Velo101.com. Retrieved 2012-07-12. ^ "1989 Tour. Official results of the second stage". Memoire-du-cyclisme.net. 2008-10-23. Retrieved 2012-07-12. ^ "1989 Tour. Official results of the 5th stage". Memoire-du-cyclisme.net. 2008-10-23. Archived from the original on 2012-03-22. Retrieved 2012-07-12. ^ "1989 Tour. Official results of the 9th stage". Memoire-du-cyclisme.net. 2008-10-23. Retrieved 2012-07-12. ^ "1989 Tour. Results of the 10th stage". Memoire-du-cyclisme.net. 2008-10-23. Retrieved 2012-07-12. "Web page dedicated to "Perico" Delgado". Archived from the original on 2009-12-22. Retrieved 2009-07-12. This page is based on the Wikipedia article Pedro Delgado; it is used under the Creative Commons Attribution-ShareAlike 3.0 Unported License (CC-BY-SA). You may redistribute it, verbatim or modified, providing that you comply with the terms of the CC-BY-SA.